To ask other readers questions about The Sign of the Beaver, please sign up. to sew clothes the indian woman and matt use needles made of what? Cultural sensitivity/ historical accuracy check: Can anyone shed light on this for me? IS it accurate? Are there any Natives out there who read this and want to speak to cultural sensitivity, and how the Native characters are handled in this story? It's the time of the American Revolution and new Americans like Matt and his family are heading out to colonize areas of virgin territory. Matt and his father head to Maine territory to stake their claim, which involves declaring their land, building a home and planting crops. Once they've accomplished this, Matt's father is tasked with returning to their home town in Massachusetts to gather Ma, younger sister Sarah, and the new baby, so they may start their lives together in their new home. In or It's the time of the American Revolution and new Americans like Matt and his family are heading out to colonize areas of virgin territory. In order for Pa to travel to retrieve the rest of the family, he must leave behind Matt to protect their claim. And poor Matt is only 13, when he realizes that He was alone, with miles of wilderness stretching on every side. He's alone, without a good dog (theirs has died), and his only gun is stolen by a sketchy trapper in one of the very first chapters. But there's a dog in the story (owned by the Indian boy) and a fox and a bear, and you can't help but cheer for young Matt, because, frankly, he's been put in a lousy position. This was a read aloud at our house, a special treat for my 10-year-old (without her 7-year-old sister—much arguing ensued!! ), and she's an animal NUTTER, so the dog alone captured her interest. I'm a dog nut myself, and I own “only” three, because I can't afford to feed more than three the way I do (organic and free range food), but I would own ten if I could. No, I'm not kidding, if I had more money or more land (or staff), I'd happily own 10 dogs. So. . . the realization of how crucial it was to own a dog hit me hard in this story. I can't even imagine being out in the woods with the bears and stinky humans without a loyal dog. Alright, alright so he is 14 in this book, but I was merely a young lass enamored with the idea of a gorgeous Native American boy to sweep me off my feet. Now about the book itself... It is an easy read for 2nd-5th graders, I would say. It doesn't teach much but the plot is catching enough that young readers would devour it. A young boy's father leaves him alone in a cabin surrounded by nothing but forest while he returns to Quincy, Maine to retrieve his wife and child. In his absence, Matt [boy] meets Attean [Indian] and against all odds, they become friends. As things progress, he is invited to join the tribe in their move West. Does he abandon the cabin he's guarded for almost a year or does he wait for his family's return? *cue dramatic music* You'll just have to read it to find out! What I don't like is the inconsistent writing. The author used very ridiculous speech for the Indians. "Me Attean. We no like white man. White man words bad". She gives the boy's father a type of hybrid old-english-southern-alabama accent, while Matt's is plain ol' english. At times, she uses modern slang such as : "the village was awesome" and "now it looks lame". I read this book years ago before I started my Goodreads account and added it to my shelves based on my long term memories of it, but I have lowered my original rating (from 4 stars to 2 stars) after reading several newer articles about its problematic misrepresentation of Native Americans. Please reference these articles in the comments below. 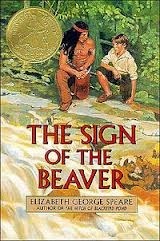 In my book, Sign of the Beaver, Matt an English teenage settler befriends and Indian named Attean. I found this book interesting because during this time the English and the Indians had a relationship that could best be described as fighting. I couldn’t get over the fact that Matt seemed to be realizing slowly that he wasn’t just bonding with Attean but slowly growing the relationship of a friend. Once Matt started to get to know Attean, through Attean’s father, the boys started to do things toge In my book, Sign of the Beaver, Matt an English teenage settler befriends and Indian named Attean. I found this book interesting because during this time the English and the Indians had a relationship that could best be described as fighting. I couldn’t get over the fact that Matt seemed to be realizing slowly that he wasn’t just bonding with Attean but slowly growing the relationship of a friend. Once Matt started to get to know Attean, through Attean’s father, the boys started to do things together. Attean taught Matt to hunt and trap. Matt taught Attean to speak English. They bonded further when Attean invited Matt to a tribal celebration. Sharing these experiences made Matt comfortable with Attean and he knew he had someone he could count on. He felt less alone in the wilderness. Also he had someone to rely on. I think this friendship was odd was because of their races. This friendship would be crazy because Attean was an Indian. It’s like a white man becoming friends with a African American man during civil rights. Everything going on around them was against it but neither if them let that affect them. I didn’t see much of that but I could tell from the first time Matt met Attean that he had never had an Indian as a best friend before. In fact he never knew why. That’s one of the reasons I think this author did that. Not just to express how strange this relationship was for this time but too also show how easy it was for people of two different cultures could become friends and be okay with it. Finally I think matt realized this friendship was different than others because he didn’t end up caring that Attean was an Indian he was just concentrated on him being a friend and a good one at that. I felt that Matt found the true meaning of friendship to him. That’s what I got from this book. Someone you think is an enemy becomes a friend. For this category of book: Historical Fiction Mid-Elementary to Middle School this is a 5 Star book. read it aloud to me and it was perfect for that also. I have read it several times and still did not get bored this time around. I would say this also qualifies as The Literature of Honor for Middle Boys which I have not put together yet. This review has been hidden because it contains spoilers. To view it, click here. Great book for young men! I liked the illustration of "both sides of the story" from the Native American point of view as well as the English settler. I loved the continual comparison to Robinson Crusoe as well as the Bible references and similar Native American version of the story of Noah. I cried when Attean and Matt had to say goodbye. Great story of survival and hope. Both my daughter and I found this book captivating. We're both fans of Native American stories, and of stories of survival. We got both with this one. Highly recommended for younger readers with a taste for pioneer-life fiction. 3 stars. Nice story for ages 10 and up. It’s educational about surviving in the wild Indian style - and seeing a friendship develop between Indian boy Attean and Matt who is 12 years old. Attean’s grandfather wants Matt to teach Attean how to read and write in white man’s language. Attean teaches Matt how to trap, fish, make a bow and arrow, etc. I liked learning things that the Indians did. It’s a pleasant read, but it didn’t excite me or surprise me the way “Hatchet” by Gary Paulsen did. Hatch 3 ½ stars. Nice story for ages 10 and up. It’s a pleasant read, but it didn’t excite me or surprise me the way “Hatchet” by Gary Paulsen did. Hatchet was the story of a boy surviving alone in the Canadian wilderness after a plane crash. Matt lives alone in a cabin in the wilderness in 1768 Maine. Matt and his father built a cabin and planted corn and pumpkins. Then the father left for many months to get his wife and other child to bring them to the cabin. 1. Usage of the word squaw. I'm pretty sure that's generally not ok.
2. Going off #1, Speare gives the impression that women were not valued in "Indian" culture. 4. The Indians all speak in stereotypical bad English. I guess at a time when not many could speak English, this might be somewhat realistic but I know it's frowned upon. 5. It seems awfully easy for Matt (the protagonist) to become basically an "honorary Indian." I think Speare was trying to do a good thing here, showing that the boys could be friends and Matt ends up rejecting some of his prejudices against Indians. However, if you were teaching this book, you'd need to address the things she does wrong. This book was really good the only thing i did not like is that I thought the ending was weird because all that Matt did was tell his parents about Attean I thought it was going to be a little bit more of exiting ending then that. So i gave this book 4 STARS! When Matt's father goes to fetch his mother and siblings from Quincy, Massachusetts, he leaves Matt alone on their new homestead in Maine. Before long, Matt has met a few people, and forms a significant relationship with Attean, a Penobscot boy, and his grandfather. The grandfather's original intent is for Matt to teach Attean to read, but before long it becomes clear that Attean is the teacher rather than Matt, and that without the input of Attean and his grandfather, Matt's survival would have When Matt's father goes to fetch his mother and siblings from Quincy, Massachusetts, he leaves Matt alone on their new homestead in Maine. Before long, Matt has met a few people, and forms a significant relationship with Attean, a Penobscot boy, and his grandfather. The grandfather's original intent is for Matt to teach Attean to read, but before long it becomes clear that Attean is the teacher rather than Matt, and that without the input of Attean and his grandfather, Matt's survival would have been much more precarious. This book is set in 1768, at a time when Maine was still a "frontier," and was originally written in 1983. I read this book because my nine-year-old / 4th grade son - who has only ever gushed about Harry Potter - told me he LOVED this book - just absolutely LOVED it. He said that there is "action in every chapter... there's always something happening... I love the story, and the time period, and what happens to Matt, and just everything." So if you are looking for a book for a nine-year-old boy, that's my son's review. If you are neither a 4th grader nor looking for a 4th grader: this was still a delightful book. A quick read for an adult, I can see why it captured my son's attention. I have been reading the Laura Ingalls Wilder books with my daughter, and while this has the same frontier / wild America feel that her books have, it is much more tightly written with less wordiness and excessive detail. While I can't speak to the historical accuracy per se, the author conveys a distinct respect for the ability of Attean and his tribe to thrive without access to the things on which Matt depends at the beginning of the book. As a result, there is a transformation of his character: he matures, begins to see that "other" is not bad, discovers how much he has to learn and how little he knew, and begins to see the world through Attean's eyes. By the end of the book, Attean has taught him invaluable survival skills such as how to make a fishhook from wood, how to make a proper bow and arrow, how to spear a fish, mark a path through the forest, identify different hunting territories, and so on. I saw a few comments on this page regarding "accuracy" and "cultural sensitivity" and "language" associated with low ratings of this book. To me, such comments lack depth and insight, and are unnecessarily judgemental. We must judge books through our own lenses, but also through the lens of the era in which they were written. With that in mind, I cannot agree with such critiques. In some ways, even though this book is 35 years old, it is entirely appropriate for our present day. There is no glorifying Matt's culture and there is no belittling of Attean's. Rather, I think Speare clearly presents a people who have adapted to the harshness of their climate, and whose way of life is being gradually destroyed. It was a good book.It had these sad moments in the book,but the rest of it was good.If our you I would read this book. I liked this book the begining was "ok" but then it started to get way better! I wanted to keep reading this book because all of us wanted to find out were his parents where they were WAIT! that would be a "spoiler alert" but you would know if you read the book. This review has been hidden because it contains spoilers. To view it, click here. The end was awful. The baby was dead and Attean was gone forever. But the general survival story was pretty neat, but nothing any average person couldn't handle. I had really hoped that Attean would come and stay with Matt for the winter and matts family would never return but hey. I'm not the writer. I'm the reader. I read the book. I was disappointed. A 12 year old boy named Matt is moving into the forest with his family. He and his father went there early to build a cabin while his mom and sisters stayed home. His father has to leave him alone for multiple weeks so he can go get Matt's mom and sister. His father left and Matt had to fend for himself. When he was fishing one day a bear came into his cabin and ate everything. Matt saw a bee’s nest and tried to steal honey, he got stung and fainted. Then an Indian found him and gave him medici A 12 year old boy named Matt is moving into the forest with his family. He and his father went there early to build a cabin while his mom and sisters stayed home. His father has to leave him alone for multiple weeks so he can go get Matt's mom and sister. His father left and Matt had to fend for himself. When he was fishing one day a bear came into his cabin and ate everything. Matt saw a bee’s nest and tried to steal honey, he got stung and fainted. Then an Indian found him and gave him medicine and then took him back to his cabin. They made a deal, if Matt teaches his son, Attean, how to read English then they will bring him food. Attean and Matt became great friends after Matt saved his dog. Then one day Attean and his father came to Matt’s hut and asked if he wanted to live with them because they're moving. Matt's father hasn't came back yet even though he said he would. Matt thinks his father might be dead. Will Matt live with the Indians or will he stay at the cabin and pray his family will come back? I enjoyed the book a lot. My favorite part was when Matt’s family came home at the end of the story. It was my favorite part because it was a happy ending. Another reason that was my favorite part was because I finally got to see how happy Matt was, and how his family acted. I also wanted to see the relationship between him and his father. What I didn’t like about it was I wanted Matt’s sister to live, and I wanted to see what Matt’s father would do about the missing gun. I also wanted to know about their neighbor s’ but besides those little things it was a great ending to the book. Ahoy there mateys! Here I take a second look at a previously enjoyed novel and give me crew me second reflections, as it were, upon visitin’ it again. I adore this author! I previously shared me second reflections of one of me favourite children’s books, the witch of blackbird pond. It was both a banned book and a Newbery winner. Then earlier this year, I read her other Newbery winner, the bronze bow, for the first time. The two reads made me want to revisit this one. And I loved it. What I didn’ Ahoy there mateys! Here I take a second look at a previously enjoyed novel and give me crew me second reflections, as it were, upon visitin’ it again. I adore this author! I previously shared me second reflections of one of me favourite children’s books, the witch of blackbird pond. It was both a banned book and a Newbery winner. Then earlier this year, I read her other Newbery winner, the bronze bow, for the first time. The two reads made me want to revisit this one. And I loved it. What I didn’t catch as a kid was that this is sort of a reverse Robinson Crusoe retelling. I think I hadn’t read that Crusoe tale before readin’ this one. In this story, a young 12 year-old boy is left behind on the new homestead in Maine while his father goes to fetch the rest of the family. Young Matt gets into trouble and a local tribe helps him out. In return Matt is supposed to teach Attean, a young member of the Beaver clan to read. This book explores the relationship between the two boys while using the book Robinson Crusoe as a backdrop. What I loved best about this book was that the “savage” tribe ends of saving the day and the white boy Matt is enriched and grows through this relationship. Now given that I am not a Native American, I am not sure how well the rep is done in this. But I do enjoy the friendship between the two boys. And of course survival in the wilderness stories always make me happy. Arrrr! Side note: I looked up the representation in this book and found this article from the American Indians in Children’s Literature website. It was excellent and I particularly enjoyed the comment section regarding whether this book should be taught in schools. Also the story was based off a real Attean who did befriend a white boy. Cool! This book was a well-written and entertaining boy-coming-of-age-in-nature story in the same genre as books like My Side of the Mountain, Summer of the Monkeys, and Where the Red Fern Grows. However, since it as copyrighted in 1983, and concerns Indians, I couldn't help but be wary of it, especially considering that it is a Newbery Honor book that I remember was required reading for most 4th graders when I was in elementary school. While the portrayal of Native Americans in The Sign of the Beaver isn't negative, I did find it stereotypical with Native Americans being used more as a symbol of the ideal of living in harmony with nature, and the "White Man" being used as a symbol of the costs of the industrialism, exploration, and the expansion of "western" civilization. I'm also a suspect of the fact that the tribe that the main character encounters is never named, and that some of the "Indian culture" seems like a mishmash of different tribal practices, or what people would stereotypically think of when they think of Indians, such as all the men wearing only loin cloths; the women doing all the work while being disdained by the men, who only hunt; and the coming-of-age spirit-vision quest for young braves. While some tribes actually did (and maybe still do) practice these things, it just seemed to me as if not much research went into writing the novel to make it good historical fiction. For my 8-yr old son's school, every year he gets a list of like 20 books he can choose from, and has to read around 4-5 and do a book report on them. I usually make him read them all. (Except evil ones like Old Yeller) This year, I realized there were many I hadn't read, or hadn't read in a very long time, so I'm working my way through them so we can enjoy them together. After he's read them, we plan on having movie nights for those that have movies. This is the first one I read. I'd never read For my 8-yr old son's school, every year he gets a list of like 20 books he can choose from, and has to read around 4-5 and do a book report on them. I usually make him read them all. (Except evil ones like Old Yeller) This year, I realized there were many I hadn't read, or hadn't read in a very long time, so I'm working my way through them so we can enjoy them together. After he's read them, we plan on having movie nights for those that have movies. A children's book that doesn't pretend to be more than it is--the fairly tame story of a 12-year-old boy left alone in the wild frontier of Maine. He is befriended by and learns from a neighboring tribe of native Americans. Written in 1984, "Sign of the Beaver" is a bit dated in the way it portrays the native Americans and their pidgin English, but still offers a sympathetic portrait of their plight as white settlers push them from their hunting grounds. In one especially clever stroke, the Newbe A children's book that doesn't pretend to be more than it is--the fairly tame story of a 12-year-old boy left alone in the wild frontier of Maine. He is befriended by and learns from a neighboring tribe of native Americans. The relatively short book is interspersed with morality lessons and adventure, but none too deep or challenging. With a listed reading level equivalent of 5.7, the novel should hold the attention of younger readers, but it may be too tame for those on the upper end of level. This is a wonderful book by the Newberry award winning author Elizabeth George Speare. It tells of a family who make a claim for land in Maine. The father and their son (about 14) go out to the claim and built a small log cabin. The father then leaves the boy there to keep hold of the claim whilst he goes back to collect his wife and younger children. Nothing goes as the father plans and the boy is left alone far longer than was intended. He is befriended by a small group of Indians and is taught This is a wonderful book by the Newberry award winning author Elizabeth George Speare. It tells of a family who make a claim for land in Maine. The father and their son (about 14) go out to the claim and built a small log cabin. The father then leaves the boy there to keep hold of the claim whilst he goes back to collect his wife and younger children. Nothing goes as the father plans and the boy is left alone far longer than was intended. He is befriended by a small group of Indians and is taught how to survive by them. He is asked by an older Indian to teach the man's grandson to read - the only book the settler boy has is Robinson Crusoe and obviously the native lad doesnt appreciate the treatment given out to Man Friday. This is a gripping well - told story and as usual for this author, provokes a lot of discussion for a child. The author tried to do show that the boys could be friends and Matt ends up rejecting some of his prejudices against Native Americans, but I really had a hard time understanding why Matt used slang words and why the Indians call themselves Indians. Aren't they supposed to refer to their tribe? I didn't feel like I learned a lot about Attean or the tribe so I'm a little confused as to how he and Matt became "brothers". The fact that Matt refers to Attean as his "Indian brother" to his sister is a The author tried to do show that the boys could be friends and Matt ends up rejecting some of his prejudices against Native Americans, but I really had a hard time understanding why Matt used slang words and why the Indians call themselves Indians. Aren't they supposed to refer to their tribe? I didn't feel like I learned a lot about Attean or the tribe so I'm a little confused as to how he and Matt became "brothers". The fact that Matt refers to Attean as his "Indian brother" to his sister is a little troubling, but this was written in the '80s so maybe I was expecting too much? I don't really like the fact that the author makes Attean seem lazy and willing to let women do the work. WOW!!! Awsome book! I read it as a school requirement, all night. It's a shorter book but has so much meaning you really have to think about what Matt (Main Character) goes through. In the very beggining of the book you find out that Matt who has lived in Massachussetts all his life, now has to move to the Territory of Maine (Takes place in the late 1700's) Together Matt and his dad build a cabin, plant crops and set up their land. It is then that Matt is told by his father that he'll be left alo WOW!!! Awsome book! I read it as a school requirement, all night. It's a shorter book but has so much meaning you really have to think about what Matt (Main Character) goes through. In the very beggining of the book you find out that Matt who has lived in Massachussetts all his life, now has to move to the Territory of Maine (Takes place in the late 1700's) Together Matt and his dad build a cabin, plant crops and set up their land. It is then that Matt is told by his father that he'll be left alone at their property, whild his father goes to get Matt's mother sister and baby sister.